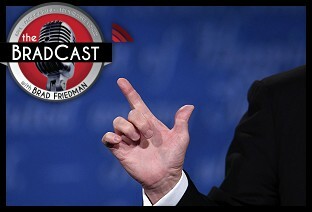 " Articles from: September 2016	"
While Donald Trump and his businesses have continuously violated state and federal law, even as he calls for 'Law and Order' on the campaign trail as detailed, yet again, on yesterday's program, Republican controlled states continue to violate federal court orders on voting rights. The latest appears to be Wisconsin who, as Ari Berman at The Nation reported, is systematically failing to supply voters with Photo IDs at Departments of Motor Vehicles as the state had promised the U.S. 7th Circuit Court of Appeals in late August. That promise prevented the court from weakening or killing the GOP's Photo ID voting restriction which has been found, over and over (and over), to disproportionately disenfranchise minority voters in violation of the federal Voting Rights Act. Joining us to discuss the news --- which has resulted today in a federal judge, on his own motion, ordering the state back in to court to explain themselves --- is Kathleen Unger, President of VotersRiders.org. Her non-profit, non-partisan organization, as Berman detailed, visited 10 DMVs around the Badger State and found only 3 of them prepared to provide Photo IDs to voters who need them to vote within the promised 6 days. Many of the others said the process would take anywhere from 6 to 8 weeks at best, long after Election Day is over and after tens of thousands of voters will have lost their right to vote. "These Voter ID laws are an unfunded mandate on citizens," Unger explains, for minorities as well as seniors, students, low income voters and others who must take time off work and travel to get the very narrow type of IDs now required to vote in states where these laws have been allowed by courts to stand. She offers details on the disturbing revelations discovered by her group during visits to WI DMVs with otherwise eligible voters, and what --- if anything --- can now possibly be done to correct the situation less than 40 days out from Election Day and with early voting already under way. She also hopes to point folks towards VoteRiders' downloadable, wallet-sized Photo ID information cards detailing the laws in each state. Informed voters may be the only hope, as chaos in many such states on Election Day is, yet again, a very serious concern. 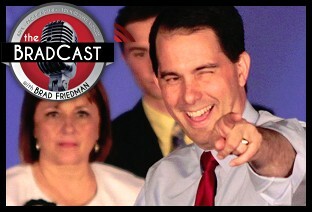 Wisconsin, as Unger and I discuss, is just the latest scofflaw "red" state to blatantly violate recent federal court requirements concerning voting rights, following on the heels of Texas, Kansas, Ohio and others. 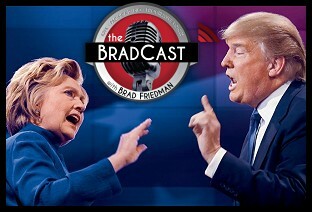 Today on The BradCast, Donald Trump might be having second thoughts about all of those calls for "law and order", even as he's clearly already having second thoughts about his years of on-the-record climate change denialism. 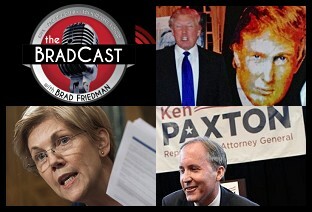 After a breaking news update on the deadly commuter trainwreck this morning in Hoboken, NJ, we move back to the ongoing Trumpwreck in these United States, including two brand new investigative reports on Trump's, um, extralegal activities regarding the New York Attorney General's probe into multiple apparent illegalities carried out by the GOP nominee's personal use of his "charitable" foundation and a blockbuster new Newsweek exposé concerning his company's unlawful business in Fidel Castro's Cuba at the height of the U.S. embargo against the island nation. All of that, even as Trump continues to pretend to be the "law and order" candidate. Also, another new report today offers more evidence, despite both the candidate and his campaign's insistence to the contrary, that the GOP nominee treats female employees of his organization poorly. Then, as yet another massive rain and flooding event plays out today, this time in North Carolina, Desi Doyen joins us for some fact-checking in response to Trump's denial of his own global warming denialism from the first Presidential Debate, as well as a response to charges that Hillary Clinton herself has not done nearly enough on climate and environment issues. 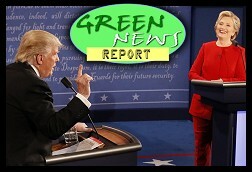 IN TODAY'S RADIO REPORT: Hillary Clinton promotes climate and clean energy, while Donald Trump denies his denial, in the first Presidential debate; PLUS: Coal industry tries to kill Obama's landmark power plant emissions standards in federal court... All that and more in today's Green News Report! Joining me to make sense of it all (though I can see it makes no sense at all), is award-winning journalist Heather Digby Parton of Salon and the Hullabaloo blog, and by David Dayen, Fiscal Times' financial journalist and author of Chain of Title: How Three Ordinary Americans Uncovered Wall Street's Great Foreclosure Fraud . Digby, writing at Salon earlier today, believes Clinton "dominated" Trump who "demonstrated not only that he didn’t prepare but that he has no underlying knowledge of the subjects a President is required to know." For his part, Dayen argues today that Clinton performed an important public service by "attacking the false premise that government is just like a business and should be run like one," adding "And it probably wouldn’t have happened without Donald Trump facing her behind the other podium." 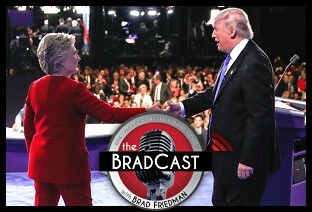 Tune in for our rollicking (and, at times, hilarious) hour of post-debate coverage, clips and analysis of the first Presidential debate between Clinton and Trump, wherein the former exceeded the expectations of many and the latter met expectations by falling apart in rather extraordinary fashion on live TV in front of the largest U.S. debate audience in television history. On the second night of demonstrations following the police killing of an African-American man, Keith Lamont Scott, in Charlotte, one of the peaceful demonstrators was gunned down in cold blood. The City of Charlotte quickly announced that he was killed by "civilian on civilian" gunfire. As it turns out, the man wasn't killed, he was in critical condition on life support at air time (AP has now since reported he has died), and several ministers who were witnesses to the shooting, including the Charlotte Clergy Coalition for Justice, believe that it may have been carried out by police, not by a civilian. "I saw the man go down on the pavement," said Minister Steve Knight of Missiongathering Christian Church in Charlotte, according to a statement released last night by the Coalition. "It was an ambush. The victim was shot while he stood between two ministers, and we believe he was shot by police. We would like to see surveillance video from the surrounding area that may have captured the shooting to determine who was responsible for the deadly shooting." As the Charlotte-Mecklenberg Police Dept. 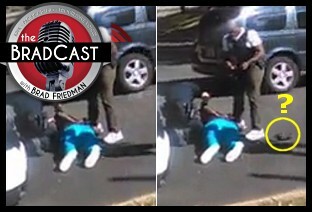 --- which currently refuse to release video from the first shooting --- say they are reviewing tapes of the Wednesday night shooting, one of the witnesses, Linda Flynn, Executive Director of the Charlotte Spirituality Center, joins us to explain what she saw from just "feet away" from where victim was gunned down. "I was about ten feet away from the gentleman who was shot. We heard a loud bang, it sounded like a gun shot, nobody knew where it was coming from, and we saw the man go down...Of course there was a pool of blood there. People who were directly next to the gentleman started vomiting because they had such a graphic view of everything." Flynn goes on to say it's "unclear" whether or not he was shot by police or not, but adds: "I think at this point even the police have understood that it is completely unclear as to how the shooting happened. There are questions there. It would be very normal for all of us to have some suspicion because we're not receiving transparency. That's what we're calling for. But I do firmly believe, as a person of faith in this community, that it was a peaceful protest until police decided not to make it not so. 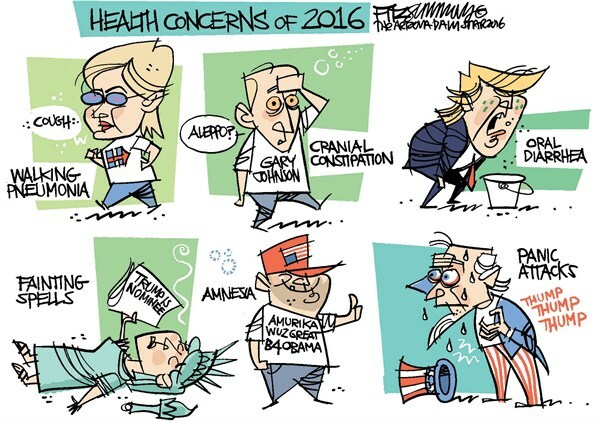 And that is our concern." 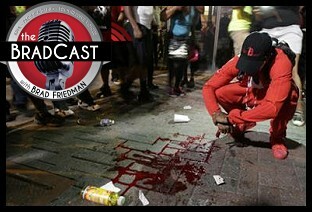 She argues that it was the ramped-up militarized police presence that sparked violence during Wednesday night's demonstrations and explains her concerns about the history of race relations with the police in Charlotte, where she says it now looks like a "war zone", and we also discuss her concerns about "seeing shooting after shooting after shooting" nationwide. 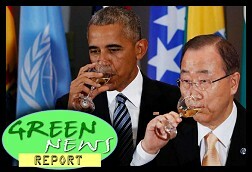 IN TODAY'S RADIO REPORT: United Nations landmark climate agreement reaches crucial threshold to enactment; White House orders federal agencies to account for climate change impacts in national security planning; Good news and bad news in the Arctic; PLUS: President Obama tells the world to put its money where its mouth is... All that and more in today's Green News Report! Protests turned violent overnight in Charlotte, North Carolina, following another police shooting of an African-American. That, just days after video evidence of another police shooting of an unarmed black man with his hands up in Tulsa, Oklahoma. Earth smashes yet another heat record for the 16th straight month, as Donald Trump takes the lead for the first time in a major national poll. Meanwhile, in advance of the first Presidential debate at Hofstra University next Monday, Hillary Clinton's campaign vows to fact check her opponent and Trump works the refs by already declaring (whining) that it will all be "unfair" to him somehow. 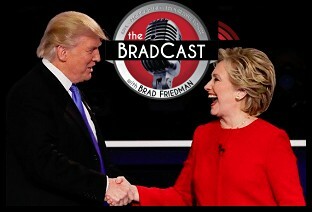 We open the phones to find out what BradCast listeners would like moderator Lester Holt of NBC News to ask either Trump or Clinton or both on Monday night. 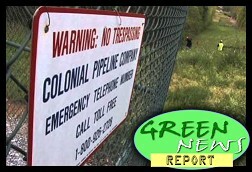 IN TODAY'S RADIO REPORT: Massive gasoline pipeline spill in Alabama; Court grants temporary reprieve for Dakota Access pipeline construction; U.N. Secretary General trying to 'Trump proof' landmark climate pact; PLUS: Leonardo DiCaprio wants you to watch over the oceans... All that and more in today's Green News Report! 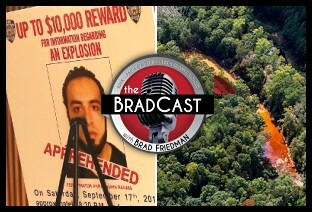 On today's BradCast, the latest breaking news on the weekend terror attacks in New York, New Jersey and Minnesota, and on the massive, broken gasoline pipeline in rural Alabama. 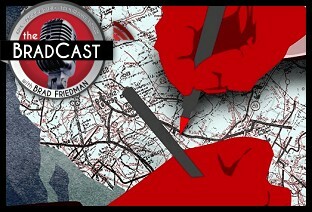 Then, after a quick update on the D.C. Circuit Court of Appeals temporarily blocking construction of the Dakota Access Pipeline in North Dakota late on Friday, we're joined by Alabama Media Group's natural resources reporter Dennis Pillion on the massive pipeline rupture in his state, resulting in a state of emergency in six states, gasoline shortages in the Southeast and, according to the latest estimates from the Colonial Pipeline company and the EPA, the release of some 336,000 gallons of gas into the environment near an abandoned coal mine in Shelby County. "They are still, ten days after this leak was discovered, having issues accessing the area right around the leak. Those estimates are based on the size of a mining retention pond that has collected a lot of this gasoline," Pillion tells me. The massive pipeline rupture, as he reports, was discovered by happenstance last week, during an on-the-ground inspection of the abandoned mine after the inspector noticed an overpowering smell of gasoline. As luck would have it, most of the gas from Colonial Pipeline's broken Line 1 --- which pumps some 1.3 million barrels of fuel every day from refineries in Houston, TX through nearly a dozen states up to Linden, NJ --- has reportedly ended up in an old retaining pond from the coal mine. The toxic fumes have made it difficult for emergency responders to begin clean up or for journalists to confirm the official information while they are still barred from the area entirely. "We don't know when it would have started leaking," Pillion says. "Colonial does says they monitor their lines twice a week by air, looking for evidence of leaks --- dead vegetation, sheens on water, that kind of thing. And they said they did not notice anything in their air patrols, nor did they notice by volume that they were losing product." That's right. They inspect the underground pipeline twice a week from an airplane. Pillion brings us up to date on what we know (and don't) about the spill and its clean up at this time, while officials from the pipeline company, as well as federal, state and local officials respond to the disaster. He also offers the latest from local environmental groups who remain concerned about dozens of endangered and threatened species of fish and snails found nowhere else in the world but in the nearby Cahaba River.